First prepare the paste by clean and cut the coriander root, put it in Mortar along with Garlic and pepper. Beat them up until the mixture is well mix into fine paste. 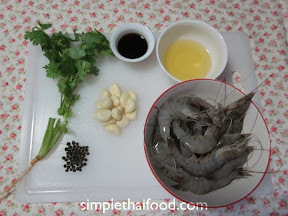 Clean and peel the Prawn then remove the black line at the back of the Prawn. Heat up the pan with medium heat, add the oil, when the oil is heated up then add the garlic paste, reduce the heat a little so the paste doesn’t get burn too fast. 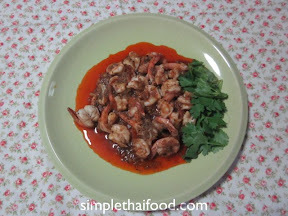 When the paste turns golden add the Prawn into the pan, fry until half cooked.